The magazine recognized Bell for her innovative work as an inventor in the fields of biotechnology and medicine. The honor places her amid lofty company. Bell’s interest in how things work goes back her childhood in Brooklyn, N.Y. When she was only 6 years old, she announced to her family that she was going to be a scientist when she grew up. As she excelled in school, she steered her aspirations toward engineering, which combined her two favorite subjects: math and science. After high school, she majored in mechanical engineering at MIT, then earned her PhD in biomedical engineering at Duke. She arrived at Johns Hopkins in 2012, initially as a postdoctoral fellow in the Engineering Research Center for Computer-Integrated Surgical Systems and Technology. In April 2016, she joined the faculty as an interim assistant research professor who will transition to an assistant professor in the university’s Whiting School of Engineering, with appointments in the Department of Electrical and Computer Engineering and the Department of Biomedical Engineering, which is shared by the Whiting School and the university’s School of Medicine. Her transition to assistant professor is slated to occur on Jan. 1, 2017. 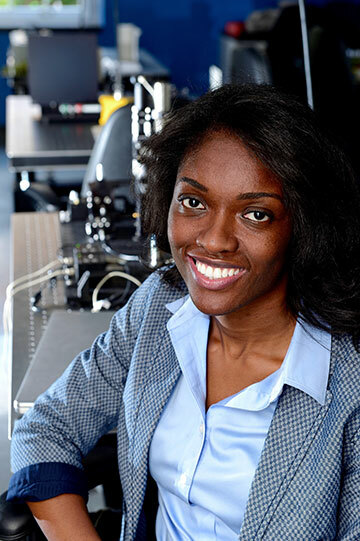 At Johns Hopkins, she founded and directs the Photoacoustic and Ultrasonic Systems Engineering (PULSE) Lab, where she is designing the next generation of medical imaging systems using fiber optics, lasers, ultrasound systems and robot-assisted surgical tools. The goal is to generate clearer live views of a patient’s internal anatomy to help surgeons avoid injuring critical features such as blood vessels and nerves while performing delicate procedures. The robotics aspect of Bell’s work builds on her collaborations with experts in the university’s Laboratory for Computational Sensing and Robotics to control individual ultrasound and photoacoustic system components and extend human reach. For example, Bell’s photoacoustic imaging system was recently integrated with a research da Vinci Surgical System to remotely control the use of an optical fiber to provide optimal views of hidden vessel boundaries during procedures that are performed through incisions as small as a keyhole. Bell plans to align her inventions with patient care at Johns Hopkins Hospital to move toward clinical use of the devices, methodologies and tools developed in the PULSE Lab. The aim is to expand and transform the realm of surgical and diagnostic possibilities. Starting today, this year’s 35 Innovators Under 35 honorees will be featured online at www.technologyreview.com, and will appear in the September/October print magazine, which hits newsstands worldwide on August 29. They will appear in person at the upcoming EmTech MIT conference October 18–20 in Cambridge, Massachusetts (www.EmTechMIT.com).